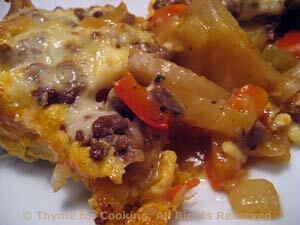 Crustless Cheesy Beef and Potato Pie, Thyme for Cooking's Healthy Weekly Menu. We'll be using 8oz (240gr) ground beef in the meatballs on Thursday, so you can get a bigger package and freeze half. (But you already know that...) As everything is cooked before going into the oven it's just a matter of melding the flavors and cooking the eggs to bind it all together. Vegetables, meat and cheese, bound together with beaten eggs makes a simple but flavorful one-dish dinner. It's like pie, but without the crust. Roughly chop onion and pepper. Cut potatoes in half the long way then slice thinly. Add potatoes and toss to coat with oil. Sauté potatoes for 5 minutes. Add the onions, peppers, garlic and continue to sauté until all vegetables are lightly browned, about 10 minutes longer. Add the beef stock, cover and cook for 5 minutes. Put vegetables in a baking dish, (9 inch, 23cm, square. Return pan to heat and add beef, paprika and oregano. Brown beef, breaking it up as it cooks. When beef is done, spread it over potatoes. Sprinkle cheese evenly over beef. In a medium bowl whisk eggs and Worcestershire. Pour eggs evenly over the cheese. Bake at 400F (200C) until eggs are set, 15 - 18 minutes. Serve.